The Chromepunk Writer’s Wordprocessor | Worldbuilding Rules! The Ghost. 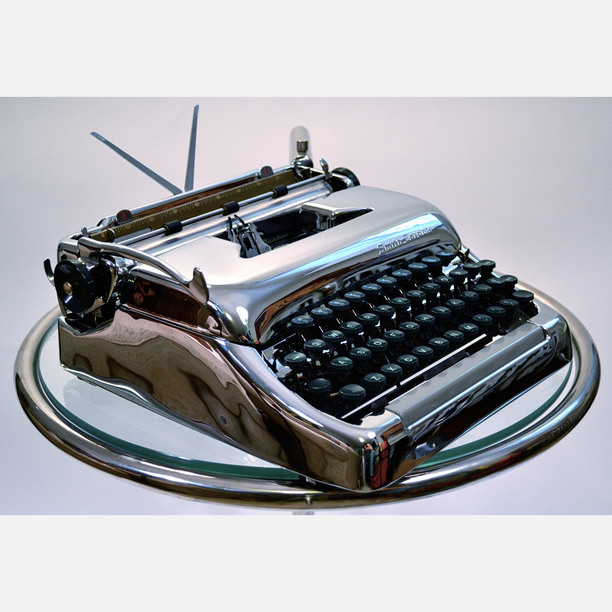 If my old Smith Corona had looked like this, I'd still own it! So if you were building a chromepunk world, the aesthetic would obviously be late 1950’s – chrome hot rods with big fins, leather jackets, pompadours. You might also get in some pointy rocket ships (Hi, Marianne P!) doo-wop singing groups, and the chromepunk version of the Blues Brothers? What kind of stories would you tell in a Chromepunk world? And what Chromepunk stories can you recommend? You’re taking me back to my own childhood with this! No! No! Don’t make me! I don’t wanna be nostalgic! First thing that came to mind was Back to the Future Part I and then all those old horror/sf movies with monsters from space stealing away teenage girls in tight cashmere sweaters. Oh, and of course, Invasion of the Body Snatchers! I guess if you’re going to do something Chromepunk, which I’m not familiar with as a new genre, you’d need to somehow add something new to all that, but I think the paranoia and xenophobia would need to be in there. Oh! How about some Big Daddy Roth Rat Finks saving the world from communistic Sputnik test animals that were mutated by gamma rays? You are just a whirlwind of ideas! Monsters from space and girls in tight sweaters seems more pulp than chromepunk to me. “Pleasantville” is another movie expedition to that era, but is it any more chromepunk than BTTF? I don’t know. Both seem very conscious of the differences between mid and late 20th century culture, while I was thinking that chromepunk would be completely and joyfully immersed in the late 50’s aesthetic, the way steampunk is immersed in the late Victorian era and Vernian science.